In the summer of 2015, I received the amazing opportunity to study abroad for two sessions through the Council on International Educational Exchange (CIEE). The first session was in Prague, Czech Republic and the other was in Dublin, Ireland. As it was my first time in Europe, I wanted to make sure that I made the most out of my experience. I spent a total of 10 weeks in Europe and I managed to travel to the following countries during my time abroad: Denmark, Italy, Czech Republic, Slovakia, Hungary, Spain, Germany, Turkey, Ireland, Northern Ireland, The Netherlands, Switzerland, England, France, and Iceland. My goal of visiting as many countries as possible countries caused me to go beyond my normal every day habits. I was able to reach out to local community members to learn more about their culture, make friends with people from all over the world, eat foods I never thought I would try, travel and navigate by myself, and make spontaneous travel decisions. These instances added to my personal development. In addition to acquiring typical travel experiences, I also had many moments where I had to step back and reevaluate my perspectives on culture. What I had initially thought about when someone mentioned Ireland were the typical associations: friendly people, Guinness, St. Patrick’s Day, and Leprechauns. While those associations may be accurate in some way, I also learned about Ireland’s conflict with Northern Ireland. My class and I had traveled to Northern Ireland for an academic excursion; the weekend included a tour of the city of Belfast, a tour of the Titanic center, and a short trip to London-Derry. Northern Ireland is well known for its history of violence and it had been declared ‘unsafe’ for citizens of the Republic of Ireland to visit until the past decade. As dangerous as Ireland and Northern Ireland had been in the past, it was incredible for me to learn how far these two areas have grown since the 1970s. 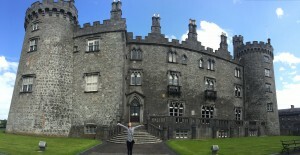 The most memorable moment of my study abroad experience was when my class and I traveled to London-Derry. We learned first-hand about the conflict that took place between those who declared themselves as Protestants or Catholics by speaking to locals who witnessed the unfortunate mass-murder events. When I entered Northern Ireland, I could pick out the stark differences between the two territories – the North uses the British Pound instead of the Euro, they use miles instead of kilometers, they have officers that carry large amounts of ammunition and drive around in a bullet proof car, there are tall walls that separate Protestant or Catholic communities, and last but not least, every section of Northern Ireland is covered in flags that declare which political and religious side is welcomed. Prior to studying abroad, I had not even known that Ireland and Northern Ireland were considered to be two separate countries. While abroad, I was often reminded of how Europe has had centuries of conflict and violence, with all territories having different reasons for engaging in warfare. My time in Northern Ireland inspired me to think critically about human rights issues. Not only did this experience allow me to delve into Ireland’s history, it also allowed me to understand the culture and society of Irish people today. It was truly a moment that I was grateful to receive. My study abroad experience was amazing, and picking just one moment to write about was hard. I studied in Dublin, Ireland at Dublin City University. The program was through CIEE and was about Irish culture. My four week stay went by in a flash, but luckily I took some great photos to remember it by. 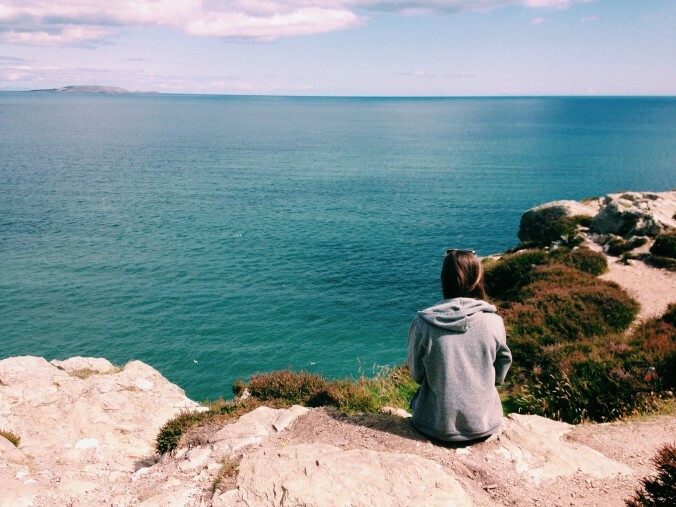 One of the best days I had while studying abroad, was a trip to Howth I took with two other girls in my program. Howth, a small fishing village just a 20 minute train ride outside Dublin, was a huge contrast to the bustling city centre of Dublin. We arrived in the morning, and ate breakfast at an adorable farmers market. While the food was delicious, and the handmade jewelry intriguing, the real highlight of the trip was the seven mile cliffside hike. About two miles in, the girls and I found the perfect place to sit and enjoy the views of the perfectly blue ocean. The sunny, 65 degree weather, which we found to be a rare occurrence in Ireland, made this hike that much sweeter. We sat on the edge of the cliffs, taking in the view and watching as Irish families had picnics and enjoyed the beautiful Saturday. To me, it’s unbelievable how sharing a moment like that with two girls I had met only days earlier, makes you feel so much closer. We finished the seven mile hike, not without getting lost of course, and stopped for a beer before heading back to the city. Thinking back on this day, I think I learned one important thing from all of the local people around us. Even though they live in such a gorgeous environment, or very close to it, they don’t take it for granted. They spent their Saturday very similarly to how we spent ours, in awe of the beautiful scenery around them. 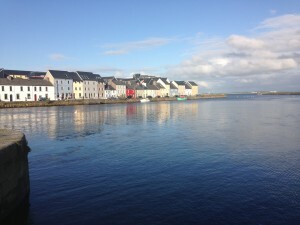 There’s no doubt in my mind that I wouldn’t hesitate to go back to Ireland given the chance. 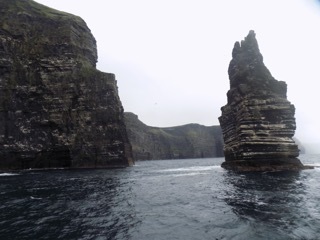 The land is breathtaking, the people are incredibly generous and love to chat, and the Guinness isn’t bad either.